I wanted to share a product with you that helps give me some peace of mind at night. Brexton is the type of baby that has to be swaddled to sleep. We are trying to transition him out of it but it’s been really hard. At nap time, we keep one arm out and he still wakes himself up about every 15-20 minutes. Everyone said, after a week or so, it would get better but he was still startling himself. I didn’t mind it during nap time because I could go in there and pop his paci back in his mouth but getting up all the time at night was becoming a real pain in the booty. If we didn’t swaddle him, he wouldn’t sleep. If we swaddled him, I still didn’t sleep out of fear that he was going to roll over. I was so happy when I discovered the Woombie Plus Swaddler + Positioner that has these side bumpers. They are basically like soft fun noodles, if you will, attached to the original Woombie. 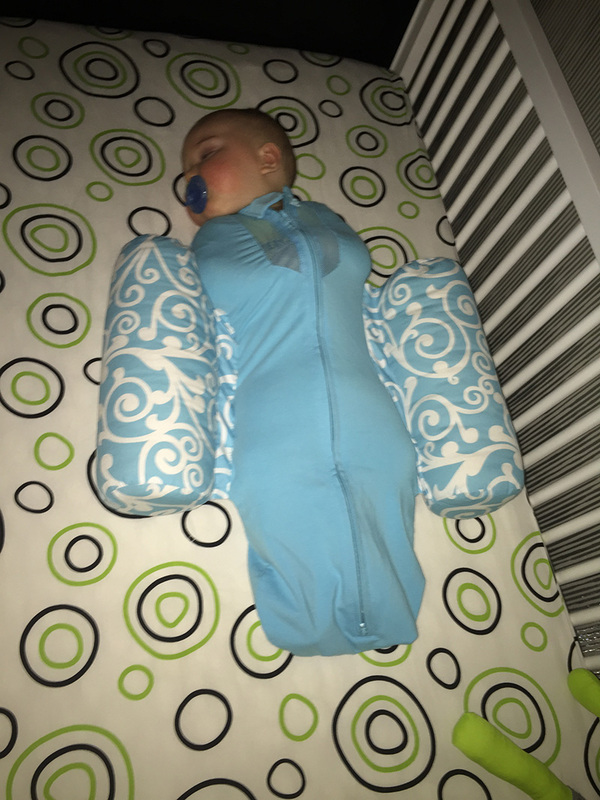 This sleep sack allows his arms more movement than the Halo SleepSack Swaddle that we used on him as a newborn so we feel that is helping the translation too. It’s nice and breathable and ultra-stretchy so he can choose to keep his hands down by his side or up by his chin. I don’t button the top because sometimes in the middle of the night he soothes himself by sucking his fingers. This sleep sack has been very beneficial to our sleep as well because it helps him stay cozy and swaddled and gives us comfort that he won’t roll.